Can a Serious Climber Also Be Vegan? 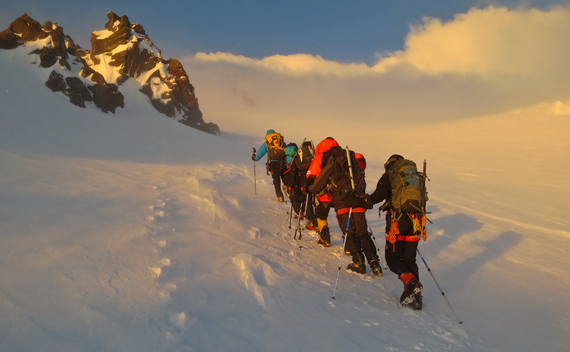 I just returned from a trip climbing the north side of Mount Elbrus, the highest peak on the European continent, located in the Caucasus Mountains. Most people whom I met on my trip to Russia were skeptical of my diet during the expedition. See, there are a lot of climbers out there, some of who have even summited Everest, but I'd venture to say that very few of them are vegetarian, let alone strict vegans. I am a strict vegan climber who attempted to summit Everest this year on a purely vegan diet, and I just summited Elbrus. Surprisingly, most of the people I met in Russia, including my guide team, had never even heard the word "vegan." Russia is considered to be a predominantly meat and dairy country due to the harsh weather. Because they can't imagine any meal without either of these items, my new Russian friends were wondering how I would be able to climb the mountain without eating meat or consuming dairy, recommended climbing dietary staples. It's not just my Russian colleagues. Most people in the field might think I'm crazy, seeing as the recommended diet for extreme climbing expeditions includes salami, Spam, cheese, processed meats, candy bars, hard-boiled eggs, and milk powder. I can't eat any of these high-fat animal products. I've been a vegan for about 12 years now and I'd consider myself a vegan for life. This is a way of life for me, no matter what endeavors I attempt. Being Indian, I was raised vegetarian, but I became a vegan to take a stand for animal rights while studying abroad at The University of Southern California. I don't think my personal stance on the subject will waver any time soon, despite the extreme physical challenges I put myself through. But, my diet has never been an issue. I've been part of over ten serious Himalayan climbing expeditions, and I've never had any problems being a vegan, even on this last attempt to climb Everest. I had no doubt that my vegan diet could have fueled me to the top had it not been for the tragic avalanche, which forced me to cancel the journey. With my latest trip to Elbrus, I proved to be the strongest climber on the team, enduring a summit under extreme conditions of cold weather, strong winds, and a full-blown whiteout. I was able to adjust to all of these severe conditions while eating healthy vegan food such as raw vegetables and fruits, buckwheat, rice porridges, wheat breads, and dried fruits and nuts. There are plenty of vegetarian foods that are part of a core diet during high-altitude climbing expeditions. As such, veganizing the menu isn't that difficult. I've successfully worked with kitchen staff of expedition operators in the local mountains near Mumbai, the High Himalayas in India, and Nepal, and even a remote region such as Northern Ice-cap in Chilean Patagonia. You can make it happen, no matter where you are. It just takes a commitment. While eating vegan has yet to prove to be an issue for me, to be truly vegan, my equipment needs to comport to vegan standards as well. My higher mountain and summit day Himalayan suit, a critical piece of gear, is made of down feathers, which is explicitly not considered vegan. Unfortunately, I haven't been able to find a suitable alternative for this critical garment needed to complete the expedition. My ultimate goal is to climb Everest completely vegan, so finding alternative vegan equipment is my next challenge. 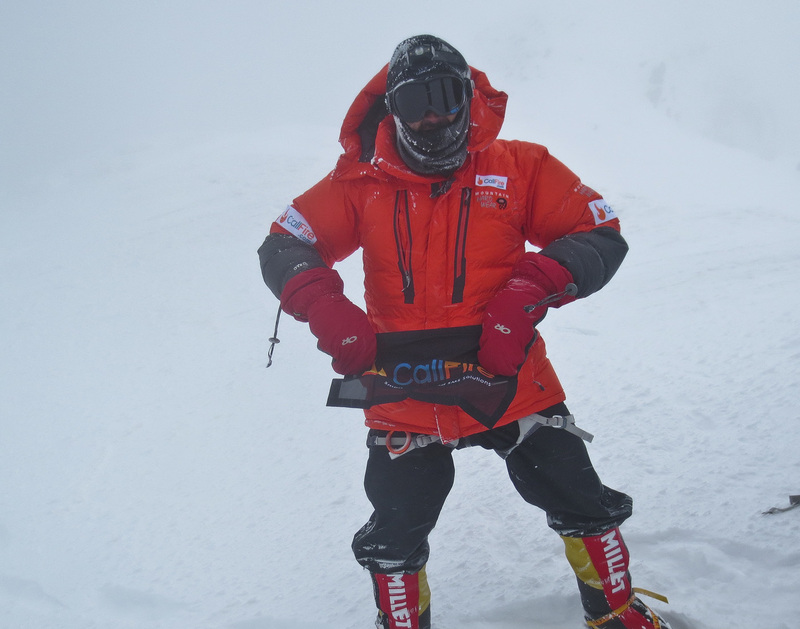 My plan is to contact gear companies such as Mountain Hardwear, The North Face, and a few others to see if they would be interested in experimenting with a synthetic Himalayan suit prototype for me to test on the mountain in 2015. Until then, I will continue to climb, proving to the community that it's possible to literally move mountains as a vegan.